if you follow me on instagram, you would have seen the picture above a couple of weeks back. I’ve been on a nail polish kick lately, and I’ve been really loving the products & colors I’ve been trying. last year, sephora came out with a new, revamped in-house nail polish line called formula x. I finally got around to trying out a couple of colors & the prepping system, which comes with a nail cleanser, a base coat, & a top coat plus a nail polish color of your choosing. I’ve found that all three steps work well for me. the cleanser helps to eliminate any lingering oils or products on my nails before I start polishing, the base coat works well in laying an adhesive foundation for the color to sit on, and the top coat is glossy & has kept my nails chip-free for 4-5 days on average, which is impressive for me since I’m hard on my hands. I do find that after a day or two, I have to apply a second coat of top coat to get back the shine, but that’s typical for me. I used to use seche vite regularly but I found that it shrunk horribly after first application, so I switched to dior‘s top coat, which is lovely but really only works best with the brand’s own polish. over other brands, it had some shrinking (but nowhere near as bad as with the seche vite). 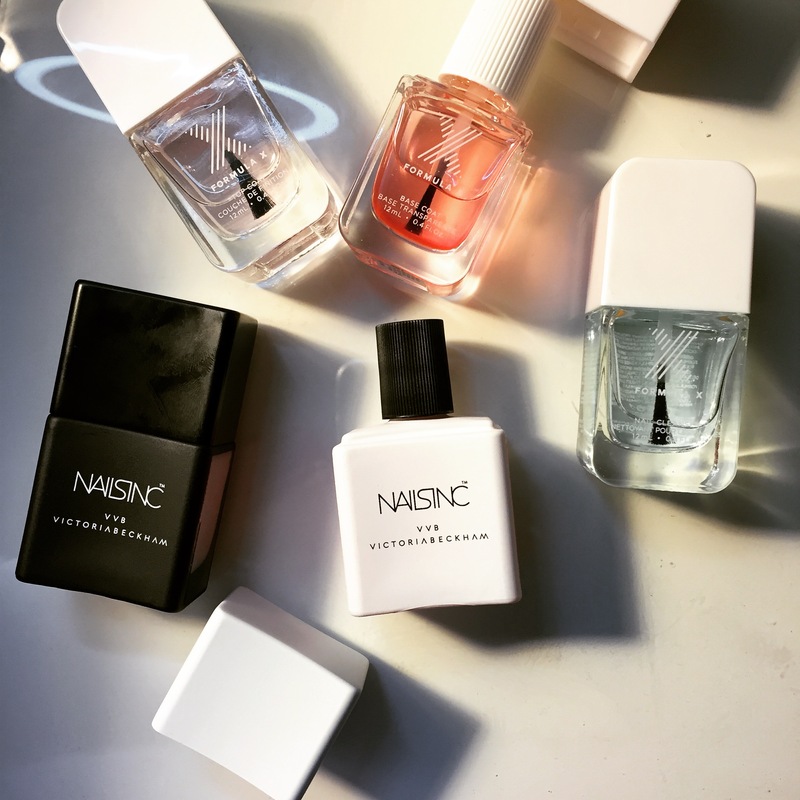 I’ve tested out the formula x system with a lot of the brands I own, including essie, chanel, dior, butter london, opi, & nails inc., as well as with formula x colors, and while the system worked best with the formula x colors & dior, it played well enough with all of them. it’s a good “one top coat for all”. my one concern is that since it is on the thicker side, it might get harder to work with over time, like the seche vite, but I’ve used it regularly over the last 6 weeks, and it hasn’t gotten gloopy or hard to work with so so far, so good. as for actual nail polishes, I’ve stuck to neutrals on my tips and a pop of color on my toes. on my hands, I’ve rotated between dior‘s lady, orly‘s dare to bare, & nails inc. x vvb victoria beckham in bamboo white. lady is the loveliest soft pink I’ve ever come across. I have a hard time finding soft pinks that don’t look too ashy or just beige on my medium-dark skintone. this one is perfect (how I wish it wasn’t limited edition!). the most neutral on me is the orly, which is really subtle & incognito on my nails, giving just enough color to cover up my nail bed. bamboo white is not actually white on me – it leans ever so slightly to a powdery pink. this one I was pleasantly surprised by, because like with soft pinks, whites are a tricky color for me, if they’re too powdery, they end up looking too stark against my skin. this one is soft & elegant, which is just what I was looking for (I wore it here; for better swatches, see Sabrina’s post). it would be a great color for the office & other more conservative situations. on my toes, I’ve gone the exact opposite & opted for color, switching between the nails inc. x vvb victoria beckham in judo red, the pair to bamboo white, and essie‘s splash of grenadine. judo red is a classic tomato red-orange that leans warm. it’s such a bold, brightening color. just like its mate, the formula was great & application was easy. spash of grenadine is not a color I usually go for, but it looked so cheery & springy in the bottle that I couldn’t resist giving it a try. it’s a really lovely pink/purple that applied well. I like that it’s bright without being neon, and I have nothing in my collection like it. I’ve loved seeing these two colors on my toes. they keep me believing that spring is on its way…even if it’s -8 in Chicago right now. -8!!! hope you’re keeping warm! if you’re lucky enough to be someplace that’s actually warm, won’t you send some of that heat up to the great lakes?